This publication is copyright Democratic Dialogue 1999 and is included on this site by permission of the publisher. You may not edit, adapt, or redistribute changed versions of this for other than your personal use without the express written permission of the publisher, Democratic Dialogue. Redistribution for commercial purposes is not permitted. This is the 11th report from the think tank Democratic Dialogue. DD grate fully acknowledges the generous support of its funder for this project, the EU Special Support Programme for Peace and Reconciliation, via the Northern Ireland Voluntary Trust. The project represents a partnership between Democratic Dialogue, based in Belfast, the UCD Business School and the Combat Poverty Agency, both based in Dublin, and Co-operation Ireland, based in both. DD appreciates the kind co-operation of the partners, without which it would not have been possible. It is a project to look at the challenging area of the future of north-south institutions and networks in Ireland in a European context. The raw material for this publication stemmed from a round-table which took place in Monaghan, near the border, over two days in March. The views expressed in this report are, as ever, the responsibility of the authors alone. The final version greatly benefited from comments by Paul Teague, Tony Kennedy and John Bradley Further copies are available from the address on the inside front cover, price �50 (� institutions, �50 unwaged), plus 10 per cent postage and packing. Comments on the publication are welcome. Anyone wishing to be kept informed of future DD events and publications should also contact the office so that they can be added to the mailing list. 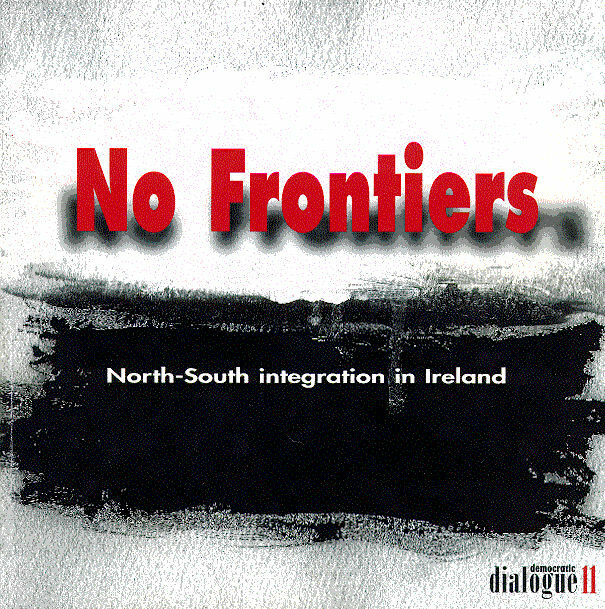 There are, potentially, no limits to the extent of north-south integration in Ireland. By integration � a word borrowed from the European Union context � we mean a process of ever-closer relations between the two states in Ireland, which nevertheless does not inexorably lead to a 憇uper state� of nationalist dreams or unionist nightmares. The aim is rather to remove all hindrances which the border presents to economic co-ordination, social cohesion and cultural reconciliation. This integration process has so far largely been confined to a business agenda and a technocratic approach. The Belfast agreement establishes the basic institutional architecture of a much wider process, via the North South Ministerial Council and the implementation bodies. It also creates the possibility of real dialogue between civil society and these north-south institutions. But this means that the initial six areas of policy co-operation and six implementation bodies agreed between the northern parties in December 1998 should in no respect be seen as placing a ceiling on the extent of integration. And it is important that the consultative forum hinted at in the agreement is indeed established alongside the new institutions � and that consultation is taken seriously, as and when it is. In particular, it is important that the new north-south architecture is not overly dominated by politicians. Non-governmental expertise will be crucial and the approach should be one of problem-solving, rather than the lowest-common-denominator, negotiation style, which constricted the pre-December 18th talks. Achieving progress in any area is also dependent on widespread participation. European experience shows how everything from the free movement of labour to mutual understanding depends on attracting the interest of individual citizens. The wider European picture is itself evolving. Crucially, the experience to date of cross-border co-operation � essentially local in scale, like the operation of the INTERREG programme in Ireland � has indicated the need for a broader perspective, of spatial planning and trans-national co-operation. Otherwise, co-operation can simply lead to new boundaries between those areas within and without cross-border schemes. The European Commission is seeking to rationalise its initiatives in this area. INTERREG would be absorbed into a larger programme also supporting spatial plans prepared by trans-national bodies. The NSMC, and the EU programmes implementation body in particular, could offer ideal mechanisms in this regard � resolving, in the process, the otherwise opaque question of how the NSMC would relate to the EU as the Belfast agreement proposes. The unprecedented opportunity created by the fiscal buoyancy of the 慍eltic tiger� on the one hand and a political settlement in Northern Ireland on the other should be exploited to begin to construct a medium-term, all-Ireland spatial plan, going beyond the 慶ommon chapters� approach adopted hitherto. This should focus on upgrading the infrastructure of Ireland in the broadest sense � including, for example, energy and telecommunications, as well as more obvious transport links. This would be in line with recent economic emphasis on the supply-side and agglomeration effects. Linked to this should be a drive to enhance the human and social capital resources on which the island as a whole can draw. This should include a strategic focus on upgrading the quality of the workforce, especially in terms of the socially excluded, and participation in it � including via extensive childcare provision. A related aim should be to establish a free labour market in Ireland, through measures such as common post-16 accreditation arrangements. This should also be associated with a radical reorientation of the northern economy towards a high-technology (and high-wage) path, like that on which the south has embarked. This entails pressing hard Northern Ireland抯 specific case for being inside the euro zone, if it is not to see post-agreement inward investment diverted elsewhere (including to the south), and pursuing a rapprochement between the two industrial incentives systems � perhaps ultimately leading to a single inward investment agency for the island. In any event, the key objective is developing Ireland as a whole as a global economic platform, including the central task of developing adequate small-and-medium-enterprise supply chains for internationally trading firms. The restriction of existing north-south programmes largely to the north and the six border counties in the south is out of sync with the demands of the post-agreement architecture. Without prejudice to specifically cross-border projects � especially those dealing with issues of exclusion arising from proximity to the border � initiatives with an all-Ireland economic or reconciliatory dynamic should be able to win financial support. The guidelines for the forthcoming tranche of the EU 憄eace package� should be loosened to allow intermediary funding bodies in these domains to support island-wide projects. Reconciliation, however, is a broader public and civic duty and it is remarkable that it figures nowhere in the 12 areas so far designated for north-south co-operation or joint implementation. This points to the need for the remit of the language implementation body to be widened to embrace the broader domain of culture and reconciliation. Its aim should be to explore new, post-nationalist and inclusive, notions of 慖rishness�. Specifically, it should operate a budget to support non-governmental reconciliation efforts across the island, which will in any event become a domestic responsibility when EU support comes to an end. All institutions in Ireland � not just governmental, and certainly not just northern � need to address their responsibilities in this area. In particular, the education system, the churches, the media and sporting organisations have much to do. Many of these challenges � such as the need for the churches to engage in ecumenical training � will be institutionally painful. But the prize is a great one � an Ireland finally at peace with itself.